Do I need an SWR meter for a backpack rig? Just bought a 40M QRP Pixie 2 kit off Fleabay. (Yeah yeah I know, not the best, but it'll do for now.) It transmits at under a watt. I'm aiming to keep it and either a Windom or maybe an end fed half wave in my BoB or bike trailer. Since I may be placing these antennas in different configurations and heights depending where I can find a place to set up, I can imagine the tuner would need to be tweaked often for the best signal. Is an SWR meter strictly required in this situation or can tuning be guesstimated based on prior experience? I would think it'd be required if I used higher power, but I can't see that low wattage doing any damage to the rig if the antenna is not in an optimal location. I would just guess the tuner based on what worked in the past, for that particular antenna height. Re: Do I need an SWR meter for a backpack rig? Probably a moot question. I just found a circuit that's super easy to build using stuff I already have on hand and that would vanish into the pack, it's so small and light. I still would like to know the answer, but more for academic reasons. For this qrp activities with a rig without swr meter, I use a endfed antena tunner that tunned throught a variable capacitor or coil, no need swl meter because the perfect tunned is when the maximum noise recepcion. You can get it the mountain tunner of Sotabeams or the Ilertenna from a spanish dealer. The ilertenna has a led to sintonize it (minimun bright is the perfect swr tunned). Yes that looks like the circuit I mentioned in the third post. The LED is actually the SWR "meter" and its brightness changes strength as the reflected power changes. Quite a simple and clever circuit, and should be simple to build and cost little and weigh next to nothing and take up little room in my pack. A win-win. 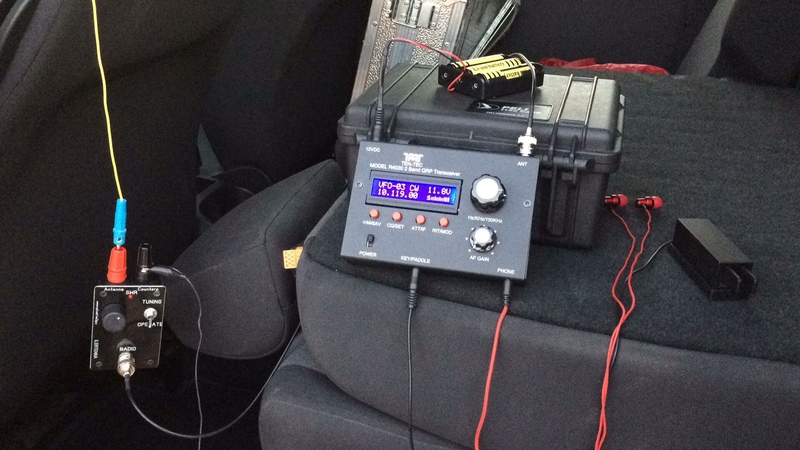 I own both the Sotabeams Mountan tuner and the SOTA Tuner. The second one has the LED indicator. When I hook these to my YouKits radio which has it's own SWR meter I find that the LED does a great job of giving me low SWR on the YouKits meter. However, with the Sotabeams Mountain tuner I found that simply tuning for maximum noise is not accurate enough to assure me low SWR on the YouKits rig. I have to use the rig's SWR meter to bring it down. So I wouldn't recommend a tuner without some kind of SWR indication if your rig doesn't have a meter. Ok but what about in the situation I describe? At home, I tune it. In the field, I put the antenna at about the same height. Would it be sufficient to say the tuner should be placed in roughly the same spot for both locations, or can they really vary that much? From one location to the next I don't have to move the tuning knob very far at all if I don't change my operating frequency. However, those tuners can have a pretty sharp Q. Often times the difference between low SWR and high is just a bump of the knob. If most everything about the two installations are the same (hight of antenna, kind of support, nearby objects, type of ground under it, etc.) it should be really close. But there are so many variables that can affect SWR and you will never be able to exactly duplicate your home setup. The hight of the tuner itself above the ground seems to make a lot of difference. Sometimes I'll stake the tuner down to the ground and sometimes I'll bungie it to a table or a branch. It just depends on my operating position's accommodations. When you set up in a randomly different location every time, you find different arrangements that seem to work best. Without a meter you won't know if it's close enough or not. Thanks all! I'll try to remember to report my success or failure later. Just a comment on the LED SWR indicator (a.k.a. Tayloe or N7VE indicator). One of the best parts of it is while you are in Tune mode you cannot hurt your rig. The worst SWR your rig will see is 2:1. If the antenna is shorted the Tayloe indicator presents your rig with a 25 Ohm load, and if the antenna is disconnected your rig sees a 100 Ohm load. I'm a design engineer and to me some of the most brilliant designs are also the simplest. The Tayloe SWR indicator is truly brilliant. Depending on the antenna resonance, e.g. if it is a half wave dipole, and thus quite broad band, then YES in general. And it won't do damage to the Pixie even if you transmit without an antenna (I THINK!). I've used a Pixie for 3000km QSOs but the problem was not just that my signal was very weak, I think it only put out some 350mW or so, on 7023kHz, but also that the receiver seemed very deaf! I suppose with so few components you cannot expect a sensitive receiver! Wide as a barn door doesn't bother me, I have filters in my brain-ears, but lack of sensitivity does. Other stations that were S9 were just copyable. If they had ALSO been using Pixies, no way would the 2-way long distance CW communication have worked. A pixie is a pretty poor choice. But that's just $5 including postage! Here are good, I hear, QRP 1 Watters and there is a 5 W amplifier there too: they are single band TX/RX but tune a few kHz, I'm thinking to try one: http://www.kitsandparts.com/1watter-V3.php -- at $47 each doesn't it seem a good investment to buy one for each band? If one goes missing, gets squashed, hit by a fly or gets stolen instead of your jewelry, then you are at least not QRT! Yes indeed the design is brilliant. Based on your comments I searched around and found an SWR indicator that has specifically been tested on the low-power Pixie I'm building. Going to try that one instead of the one linked earlier. It requires two geranium diodes which I picked up on eBay, USD $3 for 5, US ship. Good on your for trying and hopefully succeeding! I know one technically very gifted radio amateur who tried and failed... and if you search Youtube for VK3YE making the Pixie slightly less appalling he has some videos on this too which you may already have seen.